I don’t know when it happened, but the previous Joe Badali’s has been re-branded as The Badali Bar and Cucina and with it the dining room modernized. The numerous banquettes and four top tables have been replaced with sleeker models and if you’re looking to host a large group, there’s a huge table along the wall that could easily hold twenty. Although Badali’s prices are generally reasonable, during Summerlicious, their lunch menu is a steal at $18. Moreover, it’s one of the few that offers two vegetarian options (something I look for when planning work lunches). 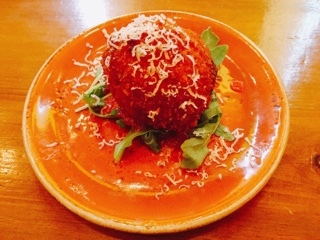 The meat-free arancini is a lovely golden brown and crispy, but could benefit from being hotter inside. Pretty flavourful to begin with, I did enjoy the flecks of sun dried tomatoes mixed into the rice, but the consistency could be creamier. 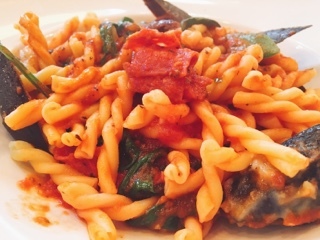 The gemelli spiral pasta was cooked perfectly covered in a tasty white wine tomato sauce. The Calabrese salami was served as three small thin slices thrown into the middle - if you’re not paying attention you end up with a mouthful of salty spicy meat. Personally, I would have preferred it cut into slivers or cubes so the salami could be evenly dispersed. 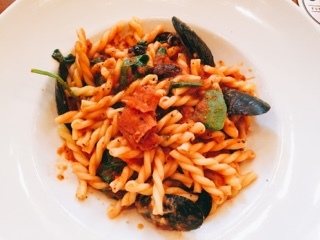 Overall, the pasta was good but with the musky mussels, the dish would have been better with chicken or grilled vegetables instead. 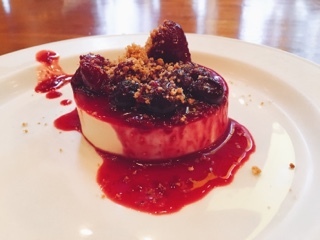 It’s a shame that the earl grey steeped panna cotta was covered in a berry compote, as the panna cotta itself was delicious. However, the mild tea flavour wiped out by the strong fruit topping; Chantilly cream topped with shortbread crumbles would surely be a better fit. Although my last visit was over five years ago, this experience was still the same: great location and warm friendly service, but the food wouldn’t make your nonna proud.